Another weak weather system is in store to start the week. A bit of rain is in the forecast for Monday, but conditions will improve rapidly toward midweek. A low pressure system and its associated cold front will generate some light rain over South-Central and Eastern Manitoba on Monday. Accumulations will generally be around 5mm in the Red River Valley and South-Eastern Manitoba. Some areas near the Ontario border may see amounts closer to 10mm. There is a small chance that some thunderstorms may become embedded within the area of rain. Any areas that experience weak thunderstorm activity may see slightly higher rainfall amounts. Since a cold front will be passing through on Monday temperatures will be cooler than on the weekend. Highs in the Red River Valley and South-Eastern Manitoba will be around 10 degrees. Some areas will be slightly warmer or colder than that mark depending on when the rain starts and how quickly the cold front goes through. The middle of the week is looking good. Tuesday should be a very nice day with highs in the mid teens and relatively light wind speeds. High temperatures on Wednesday should be in the high teens or near twenty degrees. On Thursday we will have a shot at twenty degrees yet again. Unfortunately, conditions are forecast to turn unsettled for the weekend. 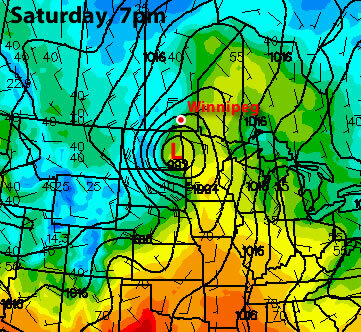 Current models show a strong low pressure system impacting Southern Manitoba on Saturday and Sunday. Should this system pan out, which is never a certainty, it could be both a rain and snow producer. It is too early to get into any further detail, but this potential storm bears watching. Warmest March on Record (Mean temperature of 2.2°C, beating the previous record of 1.6°C set in 1878). On the outskirts of the city of Nuevo-Laredo, Mexico, located near the Texan border, an unusual sight could be seen on Thursday, March the 29th. An abnormally large landspout touched down for an extended period of time, picking up dust, trees, shrubs and flipping over a trailer on the highway. In this case, thankfully no one was injured but landspouts are often underestimated and can create as much damage as a tornado, over a smaller area. 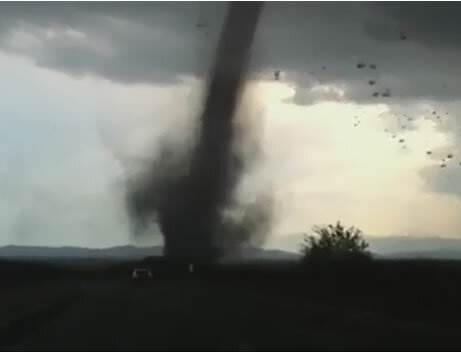 The landspout is of the same family as a tornado however they have different characteristics than a tornado, which is typically spawned by a supercell. Landspouts usually spin up under towering cumulus or non-supercellular storms, as the updraft catches the rotation at ground level. This is different compared to a tornado, which starts from the base of a supercell as a funnel and proceeds to drop until it reaches the ground and becomes a tornado. The speed inside this rotating column of air (landspout) increases as the column is stretched out and can possibly become as damaging as a tornado. The severe, elevated storm also brought with it some hail the size of tennis balls that accompanied the landspout. No other damage other than the flipped trailer was reported as the landspout moved into unpopulated areas of the Mexican plains. Southern Manitoba will continue to see unsettled weather through the weekend with system after system tracking through our region. Despite this, temperatures will remain above normal, contiuning this month’s summer-like trend. We’ll start off with clear skies this morning with patchy fog through the Red River Valley which will burn off by mid-to-late morning as that late-March sun gets to work. We’ll see our temperature get up to 12 or 13°C before skies cloud over mid-to-late afternoon. Most areas in the Red River Valley, including Winnipeg, will then have a chance of seeing some showers as a weak warm front pushes eastwards through the area. GEM-REG Accumulated Precipitation for Friday night. Overnight, much of the Red River Valley has a decent chance to see rain as the mid-levels destabilize with an injection of cold air at 700mb associated with a shortwave tracking through Central Manitoba. Positioning of the shortwave will be crucial to where the precipitation falls, but current indications are that an area of rain will blossom overnight near Brandon and travel east, with lighter showers south of the Trans-Canada Highway and 4-8mm of rain along and north of the TCH. That rain will clear out by midday Saturday, and the Red River Valley will be left with just a few clouds and beautiful temperatures around 15°C. It was not mean to last, however, as yet another low begins it’s trek into the Prairies. Winnipeg will get to 11 or 12°C before more clouds push in by mid-afternoon. Light rain will push into the Red River Valley overnight Sunday and then intensify Monday morning, dropping another 5-10mm of rain before it pulls out on Monday evening. All of these systems are sensitive to exact tracks of subtle features, so we’ll be sure to provide updates in the comments as the weekend progresses. In short, for much of the Red River Valley, the next few days will be unsettled with pleasant temperatures in the low-to-mid teens when the sun manages to poke out and showers/rain every 24-36 hours. Southern Manitoba played host to almost all the different kinds of weather out there, with many locations seeing almost any combination of thunderstorms, hail, rain, drizzle, snow and blowing snow. A system that brought heavy snowfall to Western Manitoba and the Interlake region as well as thunderstorms and rain to the Red River Valley and Southeast Manitoba has trundled off into Ontario; we’re not out of the woods yet, though, as another system is set to quickly make it’s way into the province by tomorrow morning. Photo of accumulated small hail at a downspout exit. Winnipeg was hit with hail from this size up to as large as dimes as a thunderstorm pushed through the city at around 2:30AM on Tuesday morning. For today, we’ll see cloudy skies with a chance of a few remnant flurries this morning. We’ll see a daytime highs of only 2°C or 3°C through the RRV. Another low pressure system is already on it’s way to Manitoba, however, with the parent upper trough making landfall on the Oregon coast last night. This trough will advect eastwards and rotate northwards into the Central Prairies, bringing with it a warm front that will bisect the Prairies and slowly push eastwards. 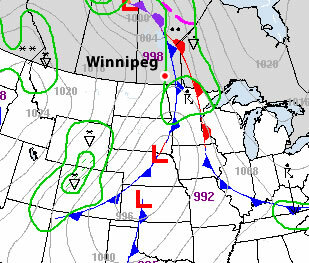 This warm front is expected to push through the Winnipeg and the Red River Valley through the day on Thursday. Current indications are that we’ll be far enough south that we won’t have to worry about snow, that should be reserved for areas a bit further north in the Interlake region. We’ll see rain push in tomorrow morning around mid-morning and clear out by early evening. Rainfall totals currently look to be fairly uniform through the Red River Valley with totals around 10-15mm, however it does look like there’s a good chance for some enhanced convective areas which will result in fairly heavy showers interspersed through the general area of rain.We’ll enjoy warmer temperatures through the rest of the week, with the warm air pushing through bringing our daytime highs up to around 10°C. We’re not out of the woods quite yet, though, as another low is forecast to track through the southern Interlake region bringing rain to areas along and north of the Trans-Canada Highway Friday night and Saturday morning. Current indications are that regions south of the Trans-Canada Highway will only see some scattered showers with this system. NAEFS 8-14 Day Temperature Anomaly Outlook, valid for April 4 – April 11. With a the passage of Tuesday’s weather system, North America has transitioned into a much different weather pattern that that which brought us our record-busting heat wave. With the blocking high collapsed over the SE United States, the summer-like heat will be contained further south in the Central and Southern Plains of the United States. Fortunately, the bitterly cold Arctic air that’s still omnipresent north of 60 will remain bottled up. So what does that mean for us? As the image above shows, ensemble forecasts are showing a moderate chance of above normal temperatures, however nothing nearly as certain as what was being predicted a couple weeks ago. The long-wave pattern has shifted to favor more frequent disturbances tracking through the Prairies, which should result in temperatures that may still be slightly above normal, but we’ll likely also see more precipitation than we had through much of March. After a period of unprecedented March warmth, it is time for a dose of March weather reality. Our first significant spring weather system will roll through Southern Manitoba early this week. This system will follow what has been a cool, but fairly seasonal weekend. Hopefully you are starting to get a feel for what spring is really like in Southern Manitoba. A strong south-easterly wind will develop out ahead of the approaching low pressure system on Monday. Wind speeds will generally be on the order of 40km/h gusting to 60km/h. The combination of strong wind speeds and mainly cloudy skies will mean that high temperatures in Southern Manitoba will stay stuck in the mid single digits on Monday. During the day on Monday light shower activity, as well as the odd embedded thunderstorm, will develop across Southern Manitoba. Accumulations from these showers are expected to be light, with rainfall amounts of only a couple millimeters expected. This weather system will really begin to get going on Monday night, with strong to severe thunderstorms expected to develop across the Dakotas. These thunderstorms will be triggered by a strong area of lift associated with the low pressure system. Additionally, a powerful low-level jet stream will provide a secondary source of lifting and a strong moisture feed. A low-level jet stream, or LLJ for short, is a “river” of very strong wind about 5000 feet above the ground. Wind speeds in the LLJ can exceed 100km/h less than one mile above the surface. The result of the LLJ on Monday night will be the rapid movement of air into the Northern US Plains and Southern Manitoba from more southern parts of the United States. The movement of warmer, more moist air into our region along the LLJ will provide support for some stronger storms on Monday night. The potential for severe thunderstorms certainly exists on Monday night in portions of North and South Dakota. It is unlikely that we’ll see any severe storms in Manitoba, but some stronger cells with gusty winds and hail may sneak across the border late on Monday or early on Tuesday. The thunderstorms that develop across the Dakotas on Monday night will eventually move into Southern Manitoba during the overnight hours regardless of their strength. Besides the potential for gusty winds and hail as outlined above, many of the storms moving up from the south will produce locally heavy rainfall. Widespread accumulations of 5 to 10mm are expected on Monday night into Tuesday morning over Southern Manitoba, but locally heavier amounts are possible where thunderstorms pass by. The bulk of the precipitation will be over for Winnipeg and the Red River Valley by Tuesday morning. Only light showers will persist during the day on Tuesday. However, residents of Western Manitoba won’t be quite as lucky. Rain will change to snow in Western Manitoba on Tuesday morning. Snow will continue over portions of Western Manitoba through the day on Tuesday. Total accumulations by Tuesday evening will generally be in the 2 to 6cm range in Western Manitoba. However, areas at higher elevations, such as Riding Mountain National Park, may see 10cm or more by late in the day on Tuesday. 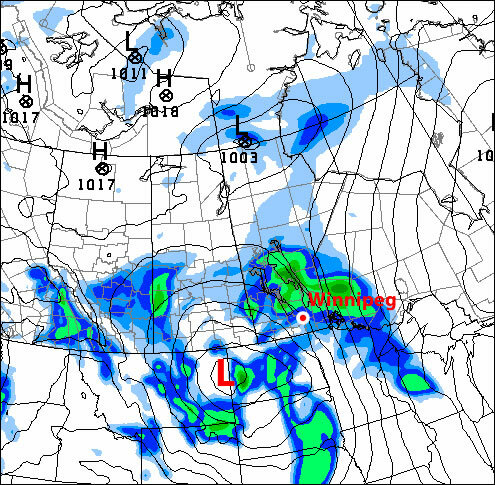 It is possible that Winnipeg and the Red River Valley could get a bit of snow on Tuesday evening. If any snow does fall it will be light in nature and won’t accumulate to much, if anything. Even if Winnipeg does get a dusting of light snow on Tuesday night it will be gone by Wednesday, as high temperatures will remain well above zero through mid-week. *Note that the above forecasts have a large margin of error given that thunderstorms will largely determine where the heaviest rain will fall. 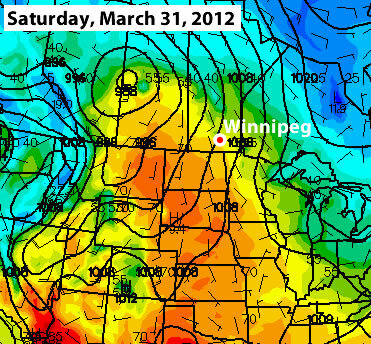 Long-range models don’t show any sign of winter returning to Southern Manitoba. The current run of the GFS model (a short to medium range model) shows temperatures potentially returning to the 20C mark in Southern Manitoba by next weekend. While this may or may not actually happen, it is a sure sign that temperatures will remain above-normal through the end of the month. This past Friday, a severe thunderstorm rolled through Indiana bringing with it strong winds, heavy rain and frequent lightning. What was so unusual about this storm was that it also dumped four inches of hail during the course of 15 minutes – which is considered quite a lengthy time for a hail storm. 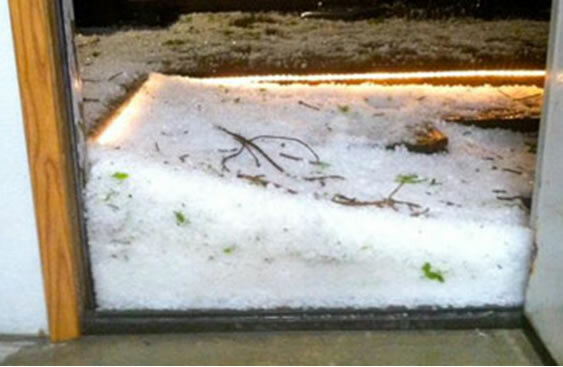 The severity of the hail storm was more than enough to wreak havoc on the highways. 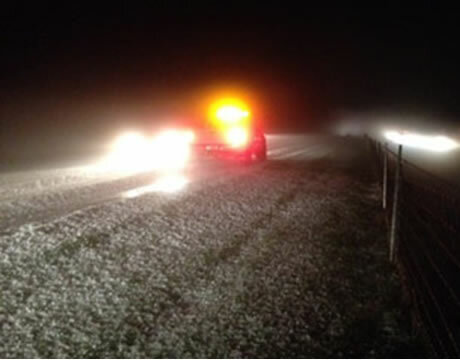 Hail drifts were reported to be a foot high in some areas and authorities closed a section of the interstate in the area due to cars getting stuck in ruts and several accidents being reported. The road conditions were winter-like as cars hit the ditch and residents described the scenery as a “hail blizzard”. After four hours, snow plows cleared away the remainder of the hail that was not melted yet and the interstate was reopened. The hail was not significant in size as it came down, only measuring up to dime-size, causing no property damage in the area. The line of storms that was associated with a cold front moving through the region also prompted tornado watches in the Midwest, as several weak tornadoes touched down in Illinois, Indiana and Kentucky. Since then, the slow moving cut-off low brought more potent storms to the Southeast US on Saturday. It has now moved out over the Atlantic and is no longer a threat to North America.